EARLY YEARS: I grew up outside Chicago, where my father was a corporate lawyer. He loved the law, and was a huge participant in civic life—very involved in United Way. My mother was on the board of Planned Parenthood for years. My parents were both Republicans in the days when Republicans were centrists, like Dan Evans. We worked hard on Chuck Percy’s campaign for governor [in 1964]. At 8, I remember singing and waving at the crowds while the campaign song blared out of the loudspeaker on the roof of the station wagon. I was totally into it. EDUCATION: I went to Hampshire College [in Massachusetts], which focused on experiential learning. It was then an all-female boarding school where it was assumed women were equal to men. The only thing under discussion was what are you going to do to save the world? CITY PLANNING: For my senior thesis, I spent nine months in the Methow Valley waitressing to feed myself while I interviewed tons of people about a proposed ski resort. It came down to “how to avoid going the way of Eagle Valley around Vail [Colorado].” I was inspired by the people at the county planning office, who published a zoning ordinance [to regulate growth]. Proponents of development broke into the office, stole all the copies and burned them on the front lawn of the courthouse. It was dramatic. BUSINESS: I knew my weakness was quantitative stuff, so I studied finance at the Yale School of Public and Private Management, which is about public management as well as private and nonprofit management. They advocate the idea that your life should be spent moving among the different sectors to have the biggest impact. BASKETBALL ARENA: In terms of the [proposed arena’s] economic impact on the city, it’s probably about a wash. I think the issue is more about the emotional and civic pride of the city. We suffered a loss as a city with the Sonics’ departure, and here we have [from Chris Hansen] a fairly generous proposal. If we are unable to make that work, it feels to people, rightly or wrongly, that once again we haven’t gone where we need to go. The question for the city is: How do you balance all the competing needs in South Downtown? We have an existing problem with freight mobility in that area, arena or no arena. We will have pressure whether it’s this proposal or another to have an arena because that’s what a lot of people want. We will also have pressure to develop South Downtown. As a chamber, we see ourselves as a convener to help get everyone on the same page. We have to figure out how to solve all of the congestion issues and get ahead of the problem. I think world-class cities figure out ways to make accommodations. We are a smart, innovative city. I would hope we could find a way to get a win-win out of this. 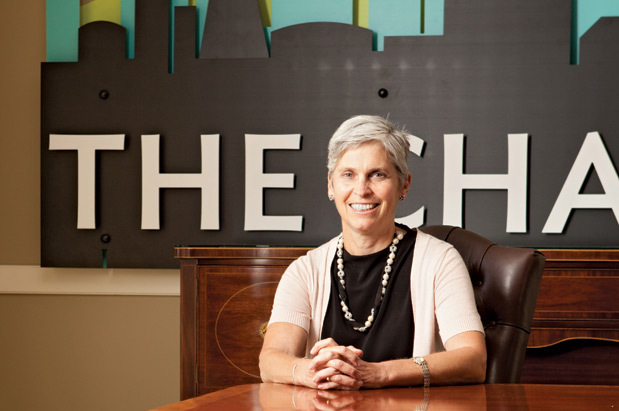 SEATTLE CHAMBER: The chamber’s mission is to achieve economic health and growth as a region, while not sacrificing the wonderful place we live and making sure everybody has access, and we don’t leave anybody behind. If you are fractured on any of those points, you don’t have a healthy business community. To thrive, you have to take care of things like infrastructure, education, health care. We are very eager to have a transportation funding package put through our Legislature and funded. Not just roads. Transit is also a big part of that. In the education area, there are multiple groups that are working on initiatives that are jelling and will need our oomph to give them support. PERSONAL GOALS: There is no one thing we need to accomplish. It’s the integration of many things. Cities are like giant organisms. They evolve and move. The chamber is in the heart of this organism, constantly watching and getting informed about efforts and always evolving in ways consistent with our agenda. WATERFRONT: Everything connects to everything else. The seawall is fundamental to public safety. It’s about protecting buildings, it’s essential. The waterfront is going to be a 20-year effort to totally build out that vision. And it will come in phases. It’s a huge opportunity for the city to face the water very differently, to develop a place where people love to walk, bike, play and shop. THREATS TO DOWNTOWN: I’m getting e-mails once or twice a week from businesses distressed by the tenor of activity on the streets. It’s not just panhandling. It’s an array of behaviors that put off customers and make customers more apt to be reticent to spend time in downtown Seattle. We were a big supporter of [City Council member] Tim Burgess’ measure [to limit panhandling] that the council passed and the mayor vetoed. We are hoping that an ordinance will come down the pike that will help address these concerns. THE FUTURE: People sometimes ask how come Seattle can’t get anything done. But, in fact, we are getting things done. Look at South Lake Union. Look at the tunnel and 520, winning the supertanker and getting the 787 program. We are getting big things done but we just aren’t recognizing it. I think [the city] is on the cusp of reaching a different level, and we need to seize that opportunity. We are the envy of a lot of other regions. Because we have Boeing, Microsoft, Amazon, Nordstrom, Starbucks and REI all headquartered here, we have a brand and recognition when we go overseas. To seize the day, we need to educate people so they can take all the jobs that those companies create. We need to make sure that we build infrastructure to keep transportation lines open so that goods and services can get out of here to other parts of the world. I think shame on us if we don’t do that. But we are doing it and that’s encouraging.